The Internet of Things – Pain or Panacea for the Homeowners Insurance Market? Cooking is the number one source of house fires and, according to the U.S. Fire Administration (USFA), 50% of all reported home fires stem from cooking equipment.1 What if there were a way to reduce these? What would it mean for writers of Homeowners insurance whose premium dollars pay for these losses? These issues and others are investigated in this article as we explore the phenomenon known as the Internet of Things (IoT) and the impact it could have on the Homeowners insurance market. There is no consistent definition for the IoT, but it generally refers to the ability to interconnect devices embedded in everyday objects so that they can send and receive data wirelessly and, increasingly, for the devices to learn from the behavior of the user. What is consistent, however, is the forecast for this trend to grow exponentially over the next few years. Growth projections vary but most estimates suppose that the number of internet-connected devices will reach around 35 billion by 2020, over double where we are now. This rapid growth is attributed to the broad number of sectors where the IoT can play a part - healthcare, automotive, residential, industrial, government, etc. The focus of this article, however, is how the IoT is increasingly being adopted in the home and the implications it might have on Homeowners exposure and associated insurance. The rise in home use of the IoT is synonymous with the terms "connected home" or "smart home" that we often hear these days. Over the last few years manufacturers have been pouring into the residential property market to bring new "smart" gadgets to consumers for a variety of uses in their homes - everything from lamps and window shades that can be controlled remotely, to baby monitors that can be checked from afar, and to thermostats that adapt to your daily routine. As a proliferation of smart devices appears in the home, an increasing number of devices will have implications for Homeowners insurance. Suppose, for example, that we return to the example at the beginning of this article. Imagine that a smart device was affixed to the stove and that this device detected the increase in heat or size of flames; imagine it was then able to relay that information to another device on the gas supply, which shut it off. Crisis averted and loss contained. Other such loss-saving applications of the IoT exist, too. Picture a device detecting that the water in the pipes is about to freeze and turning on the heating, or a device detecting that the weight of snow on the roof is getting to a critical level and alerting you on your phone. Think about a security device that can sense an intruder when you are away on vacation and can relay that information to the police or security firm. 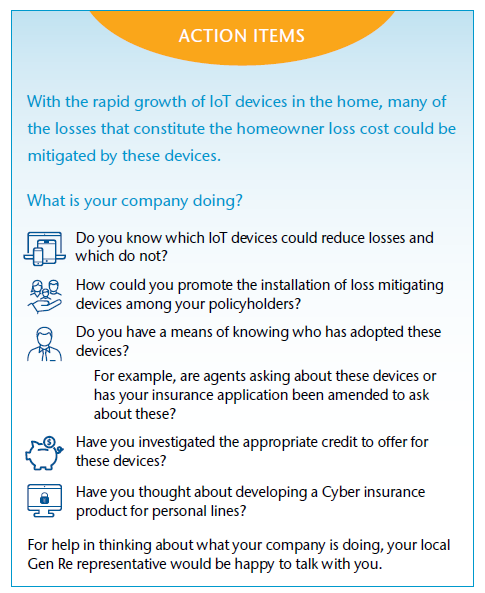 The variety of such scenarios supports the idea that the increasing trend of the IoT in the home may reduce the number of property claims faced by insurers. What's more, those claims represent many of the most common attritional losses that could be mitigated by the advent of the IoT. 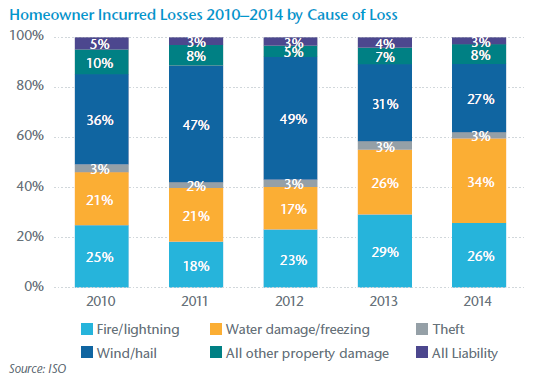 If we look at the data from ISO for the period 2010—2014, approximately 40% to 60% of all losses can be attributed to either fire/lightning, water damage/freezing or theft losses. Clearly, not all of these losses would be mitigated by the IoT and adoption of devices will never be universal. Nevertheless, it is not beyond the realm of possibility that maybe a quarter of all losses - principally, those from cooktop fires, pipe freeze claims, snow-related collapse, water damage from cracked or leaky pipes and some theft claims - could evaporate in the long run. Nevertheless, many would argue that some features associated with smart homes may actually increase the exposure to the homeowner and, whether covered by the policy or not, this has the effect of stunting adoption. Most of these concerns revolve around the possibility of a security breach via the susceptibility to cyber criminals or hackers. It is true that with so many networked devices - many of which have underdeveloped security software - the smart home presents increased entry points for cyber criminals. Identity Fraud – A key concern is over criminals gaining access to personal information, online accounts or credit card information and using these to commit a crime in your name. This is a valid concern and most Homeowners insurance policies do not cover identity fraud. However, for a small premium many carriers will now offer coverage by endorsement or on a stand-alone basis with a modest limit. It should be noted that coverage does not extend to replenishing a policyholder’s bank account when a fraudster drains it; that exposure should be covered by the bank's zero liability policy. Ransomware/Cyber Extortion – Ransomware is a related area that cyber criminals are exploiting. This malicious software, which is designed to freeze your computer until a sum of money is paid, is also excluded under most Homeowners policies. As in the case for identity theft, however, insurance products are emerging to fill this gap concerning ransomware and other such personal lines cyber exposure. Denial of Service Attack – An area causing considerable concern for many commercial enterprises is over the susceptibility of IoT devices to be infected with malware, which in turn allows them to be recruited into a “botnet” army of similar such devices. Once infected, these devices - printers, IP cameras, baby monitors etc. - can cause a distributed denial-of-service (DDoS) attack by bombarding a local server with traffic until it collapses under the strain. For writers of Homeowners insurance, the concern lies with whether any subrogation could be made to the respective device owner's personal liability coverage - especially if policyholders were deemed negligent in updating passwords or downloading software patches, etc. While this area has no legal precedence - in part, due to the difficulty of identifying all the relevant devices that are responsible - Homeowners liability coverage typically requires property damage or bodily injury to have occurred, so the susceptibility of the policy may depend on the nature of the damage sustained in the DDoS event. Theft – Keyless home entry systems are increasingly abundant these days but networked security systems may present less of an obstacle to cyber criminals than a good deadbolt. However, not all burglars are seasoned hackers, so it remains to be seen whether these "smart locks" will increase or reduce the incidence of theft. Overall, though, it should be noted that theft limits in a Homeowners policy are modest in relation to overall policy limit. Physical Damage – The last key area of concern is over a cyber attack capable of causing actual physical damage. In the same way that the Stuxnet virus wreaked havoc on Iran’s nuclear program in 2008–2009 and a ThyssenKrupp plant suffered "massive damage" when hackers gained control of its production line, hackers can still cause first-party damage to a homeowner via an IoT device. Gas lines could be opened, stoves turned on, water taps left running, etc. Again, these are valid concerns and could generate losses that would be covered by a Homeowners policy. Fortunately for the homeowner, while industrial plants or government infrastructure present natural targets, the motivation to cause physical damage to an individual homeowner is more limited - disgruntled neighbors aside. While concerns associated with cyber criminals or hackers are the most prevalent, many misgivings also stem from the threat of device malfunction. This could lead to both property and liability claims. For example, what if a homeowner is reliant on an IoT thermostat to prevent pipes freezing in a vacation home and it fails? Or what if a tenant suffers injury when the smart carbon monoxide alarm fails to go off? The finger may point to a product liability issue, but not if malfunction was due to the homeowner installing the devices incorrectly. Lastly, there is the question of whether the prevalence of house fires may actually increase due to a spike in the number of new devices being plugged in at home. This not only stems from the batteries in many of these devices - think hoverboards and Samsung's Galaxy Note 7 - but also the load that they place on the home networks. Insurers who innovate will be the beneficiaries of IoT. Overall, it would appear that the IoT has the ability to offer a net benefit to Homeowners writers. However, the onus is on the insurance carrier to determine exactly which devices can best reduce property losses without opening the door to cyber exposure. For example, devices should have proven battery technology; a device that only turns the gas off would seem preferable to one that has the ability to turn the gas both off and on; and having requisite software encryption standards on devices will be critical. In addition, making a Homeowners Cyber insurance product available seems a good way to mitigate many people's reservations about adopting these devices. Other challenges for insurers will be to determine how to promote these devices among policyholders and how to measure their uptake. Educating agents will be key to both promoting the right IoT devices and tracking adoption, and updating applications to identify such users will also be critical. It will take time to acquire enough data to determine the appropriate size of the credit for such devices but insurers that get ahead of the curve could benefit in the long run. To determine which devices could qualify the policyholder for a discount, American Family Insurance in Madison, Wisconsin, has reportedly installed more than 100 connected devices in a one-bedroom house it uses as a training center, and employees test products in their own homes. State Farm is another carrier that is already applying a 15% credit for certain IoT-based home security systems.2 If the market is writing an average Homeowner policy at $800, for example, but you can identify similar policyholder situations that could be written at $680, then it would not be long before you could increase market share. The widespread rollout of IoT devices in the home may still be some way off, as resistance is inevitable from policyholders who perceive IoT devices in the home as an invasion of privacy or an increased security threat. However, lessons can be learned from the Auto insurance market where telematics - devices installed in cars that record and relay information about driving habits to the Auto insurer - have given Auto carriers the ability to offer personalized pricing of each policy. As such, the insurance industry has helped push these devices forward by providing the lure of reduced premiums as an incentive to install the devices in cars. In fact, a 2014 study by Morgan Stanley and Boston Consulting Group showed that more than 81% of consumers would be willing to share additional information with auto insurers if they were to obtain price reductions.3 The same might then be inferred for the Homeowners market. With significant premium savings to be had, it is likely that insurers could coax policyholders into installing devices that could benefit both insurer and insured in the long run. However, while Auto insurers will typically foot the cost of an inexpensive telematics device in a car, it is more likely that policyholders would be the ones bearing the cost of installing smart devices in their homes. Nevertheless, the opportunity exists for insurers to forge a relationship with manufacturers to promote or subsidize those devices most effective at reducing losses. So far, the adoption of telematics by consumers has been slow to take off. Although 81% of consumers might be prepared to have a telematics device installed in their cars in exchange for lower premiums, many drivers fear that their heavy foot or sharp braking could actually lead to a premium increase instead. By contrast, if insurers can promote IoT devices that only have a net reduction in premiums, then they can avoid this particular roadblock to adoption. Another parallel with the personal auto market is that we might expect an uptick in loss severity. As smart homes get filled with more of these devices and technology, the cost to replace or repair them may add additional costs to the total loss. Whether this is enough to offset the potential for reduced loss frequency remains to be seen. Given that the IoT phenomenon is still in its infancy, the magnitude of its impact on the Homeowners insurance market is hard to predict, but it could be profound. If insurers are prepared to do the due diligence, they might find that they can develop a competitive advantage. The IoT offers new tools for price differentiation, and rather than being a reactive tool - in the way that many analytical tools can be - the IoT presents the opportunity to be proactive. It is highly conceivable that insurers can promote certain IoT devices that will benefit both insureds in terms of premium reductions and insurer in terms of enhancing market share. 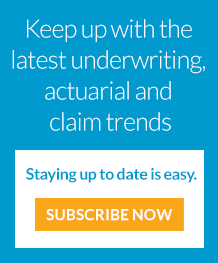 Rather than trying to find better policyholders, insurers can now create better policyholders. Reduced property losses resulting in lower premiums may alarm executives who do not want to see a shrinking top line. However, what is also apparent is that as smart home devices pour into the market, a demand is likely to develop for a robust Homeowner cyber product that helps allay policyholders' concerns about adopting IoT devices and could help plug any drop in topline premium. Already such products are coming onto the market and insurers are increasingly looking at this as part of their products suite for the future. Overall - as has been the principle of all profitable companies - those that can adapt will survive.